Note events are used to trigger (play) software instruments and external MIDI sound modules or keyboards. Ch(annel): MIDI channel of a note from 1 to 16. Num(ber): MIDI note number (or pitch). The range is from C −2 (note #0) to G8 (note #127). Middle C is note #60. It’s known as C3 in MIDI terminology. On some keyboards and synthesizer modules (notably those made by Korg and Roland), the note range is from C −1 (note #0) to G9 (#127). Middle C is called C4 on such devices. The Display Middle C As pop-up menu in the Logic Pro > Preferences > Display pane allows you to alter the display to match your device. Val(ue): Velocity of a note from 1 to 127. The zero value (0) acts as a note off message, and cannot be used. Length/Info: Length of the note. 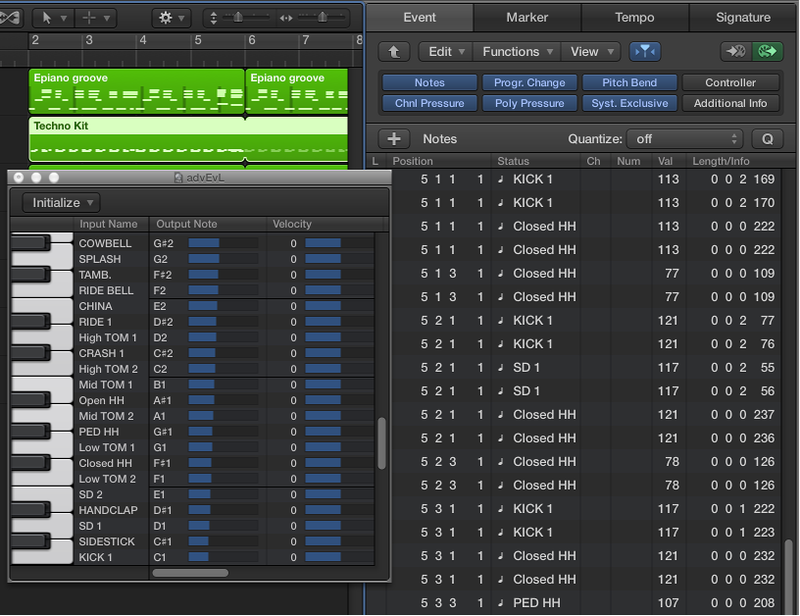 Although MIDI can only transfer note on or note off messages, Logic Pro X stores the position and length of all notes, which makes them easier to access musically. The note off message is generated automatically during playback. If the edited MIDI region is played through a mapped instrument, the names defined for each individual note appear in the Status column. A small note symbol to the left of each name aids in identifying these named events as note events. You can edit the release velocity of a note event when the Additional Info button is on. Click the Additional Info button (only available in Filter mode).